I received the copies of your new English language edition of Facts are Facts and passed out all but one for myself. The reaction of the staff is the same as mine: you have done a wonderful job, and I strongly congratulate your intelligence and talent. You are accomplishing something with your unique editorial policy which I never have even attempted - mixing the practical and the political with the spiritual; thus overcoming the negativism in criticism alone. I think that this is a winning formula; surely, criticism alone is not. This is to say that I am excited about the excellent information being given on microwaves! I have just seen the new English language version of Facts are Facts. Magnificent! Congratulations. I was intrigued and excited by Facts are Facts. 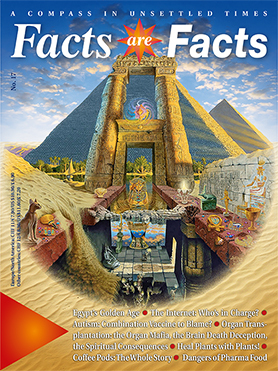 My congratulations on the publishing of the first English Facts are Facts magazine. It is wonderful and a credit to you. When my friend gave me the first issue of your magazine I fell in love with the content. I believe that Facts are Facts is the 'best tool' to get people "on the way". Thanks to the variety of topics one can give Facts are Facts as a gift to everybody. I am a reader and certainly an enthusiastic reader from the first edition. Your commitment is admirable and I congratulate you to your staying power. You really "grasp the nettle" and you courageously take on the battle against the flood of misinformation. Keep at it! My congratulations. It has taken a lot of years to reach this milestone. We would like to take the opportunity to sincerely thank you for bringing the truth in such a wonderful to the people. Above all we both feel strengthened in what we already know or thought we knew and we can pass these information on to our many friends!